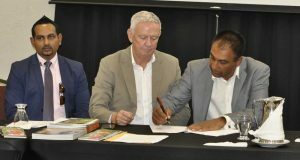 Alem Hussain (left) signs the contract document in the presence of Roddy Carr (center) and Mitra Ramkumar of Tourism Hospitality. Guyana is set to benefit from the Jack Nickauls Design Group as the organisation yesterday signed a contract with local companies Caricom Investment Management Group (CIMGRO) and NexGen Global Marketing for the construction of a world class golf community here. Works on the facility is expected to commence in the first quarter in 2019 and will cost US$100m and spanned an area of 500 acres. It is expected to be completed within 18 months. Carr said it is always good to showcase and they have done similar facility in Dubai, Barbados, Singapore and Bermuda. “Golf tournaments usually showcase the country, so we will bring some type of world class event to open it and we would then be able in that broadcast to two or three hundred million people to showcase not only the golf course but inside Guyana,” he stated, adding that there will be resorts with golf courses in Guyana because they would have to deal with the growth of the people and tourism.